Grazing is the healthiest, most nutrient-rich (and cheapest) food you can provide your horse, which is why it’s so important to manage it well. This can be a difficult balancing act as in winter all you want is grass cover, and in the spring and summer months the aim is to restrict grazing. - Grass grows five times faster in May than it does in September. - The key to managing your grazing is rotation. Ideally, paddocks should be rested for 2-3 weeks at a time to allow them to recover. Longer is better, but this is rarely feasible. - Where hay and/or mineral licks are provided in the field, make sure you move them around to avoid areas becoming poached (creating the ideal environment for poisonous plants and weeds to seed). Poaching becomes more of a problem when fields are particularly wet and muddy, so grazing should be restricted as much as possible. - In growing season, grass should ideally be kept to a height of 5cm and 2cm in winter to protect the ground from the impact of hooves. 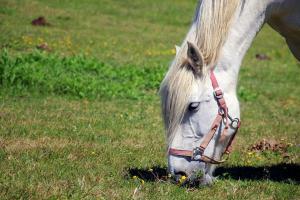 - Weeds – some of these are incredibly poisonous to horses, such as ragwort and foxglove. It is vital that you familiarise yourself with the list of poisonous plants so you know what to look out for and what to remove (ideally by hand-pulling/using a specialist pulling tool and burning). Not only will this protect your horse, it will ensure you don’t destroy beneficial plants or herbs in error. Not all weeds are toxic but they are invasive, so remove docks, thistles and nettles where you can, as your horse isn’t going to eat them. Spot treating with a herbicide will help you stay on top of weeds, but you won’t be able to graze your horse for a given time afterwards, so check this out before treating. - Removing faeces – do this as often as possible to aid parasite control and avoid overgrazing of remaining areas of the field. Regular poo-picking will reduce the worm burden (meaning you may need to worm less!) and minimise pressure on other parts of the paddock that haven’t been fouled. - Test soil nutrient levels and pH balance – check on this every spring to make sure the balance of phosphate, potash and nitrogen is correct. If it isn’t, you may need to apply a fertiliser before resting the grazing (speak to an expert about this). The soil pH should be 6.5. Spring: this is the most important time to think about grass management, as it lays the foundations for the year. - From March it is a good idea to harrow the land. This aerates the soil and removes dead vegetation. Once this is done, reseed and fill in any bare areas. - Roll the ground to level the surface and flatten poached areas, but only if the land is dry and rolling won’t cause further damage. When done correctly, rolling can promote early grass growth. - Identify and remove poisonous plants and invasive weeds. - Maintain your weed control and top the paddock to remove stalky areas and stop weeds from seeding and spreading. - Maintain your weed control. - Now is also a good time to insulate your water pipes in time for winter. - In areas where poaching is a problem, add a material such as woodchip to access points, including around gates and hay nets. You could also use grass mats which allow water through but provide a firm platform and help level the ground surface. - If you can rotate, choose a well-drained paddock for this period. - Check your horse’s water daily to ensure it hasn’t frozen over. - At the end of winter (ideally February) have a look at your soil and determine if fertiliser is needed ahead of spring.